We regularly update our Facebook page with all the latest news. 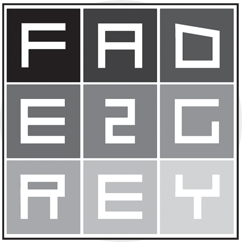 You can find us at @fade2grey we'll also keep you up to date there. Boat tickets to be booked & paid for separately with Travel Trident (guaranteed seat based on booking entry to gig) @ £11.50, dedicated boat times from Guernsey are 17.15 18.15 & 19.00 - Return from Herm is 22.45. Wristbands required as entry for the event will be available to collect from the Travel Trident Kiosk from midday on Saturday 18th May. (Earlier boats are available at normal price £13.50). 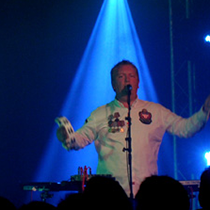 Nostalgia collides with technology to deliver 1980s Electronica. 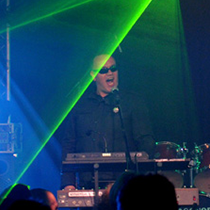 Fade2Grey deliver an exhilarating live show bringing together songs by The Human League, Depeche Mode, Soft Cell, Gary Numan and many others in an unforgettable electronic experience. 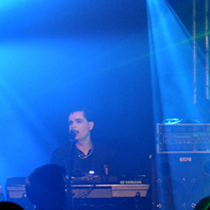 Fade2Grey have worked with Hazel Dean, The Beat, Toyah Willcox, China Crisis, Pat Sharp and Strange Arrangement. la la la la. La la la, la LA LA LAAA LITTLE GARY NUMAN, LITTLE GARY NUMAN la la la laaaa la la la laaaaa! LITTLE GARY NUMAN, LITTLE GARY NUMAN la la la laaaa la la la laaaaa! LITTLE GARY NUMAN, LITTLE GARY NUMAN la la la laaaa la la la laaaaa! LITTLE GARY NUMAN, LITTLE GARY NUMAN la la la laaaa la la la laaaaa! The best thing about fade2grey is that I get to play my Sequential Circuits Prophet 5. I bought it in 1982 when I was in a band called the Pulse and it’s been with me ever since apart from when I sold it in the early nineties and missed it so much I tracked it down in London and bought it back. It’s getting on a bit now and is a bit temperamental – but hey aren’t we all? It’s great ‘doing’ the eighties again. This time I’m determined to remember it. 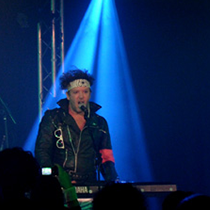 Andi stands on the right (as you are facing the stage). To him, thats on the left. Already faded to grey he can't keep up with the extravagance in hair styling shown by the 'fop' to his right (your left as you are looking at the stage) but he seems happy with his hoard of Russian medals that he (for some reason) has awarded to himself and wears very proudly everytime Fade2Grey takes to the stage.